The Boxwood 'Green Velvet, Buxus 'Green Velvet', also known as Boxwood, is a slow growing broadleaf evergreen that requires little care. With a plant height of 2-3' and a spread of 3', it does add color and texture to the landscape. Plant 'Green Velvet' in full shade to part sun, in a well-drained area. 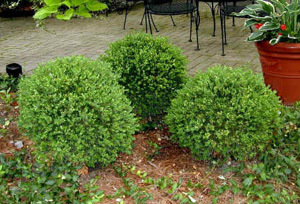 Boxwoods are tolerant of pruning and shearing, but avoid cultivating around this plant because they have very shallow roots. Remove dead and damaged branches annually to improve the air circulation. Plant in a sheltered location to protect it from cold winters and strong winds. The Green Velvet is a 1997 Styer Award Winner & 1998 Michigan Growers' Choice Award Winner.